Our Patron Saint, St Vincent of Saragossa, was probably chosen on account of the association of his name with the Clifton Rocks, although there is considerable uncertainty over this and many possible reasons for the Lodge's name have been discussed. St. Vincent was a Spanish deacon who, in AD 304, was thrown into prison with his Bishop, Valerius of Osee, in Granada by Dacian, the Governor of Spain, under the edicts of the Emperors Diocletian and Maximian. St. Vincent was tortured first upon the rack, and then by fire upon a gridiron and by many other torments, but his constancy remained unshaken and he was taken back to prison where he died. Dacian commanded that his body be thrown on a marshy field among the rushes, but it is recorded that a crow defended the body from wild beasts and birds of prey. The original banner of the Lodge was paid for and presented on 22nd January 1885 by Bro Alfred Deedes, the Treasurer at the time. 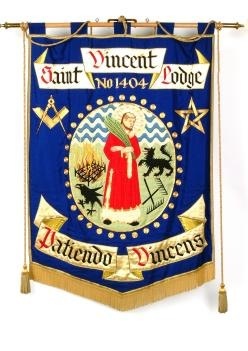 The present banner was designed by Francis Cecil Horstman, the former Vice-Principal of the College of Art at Weston super Mare who joined the Lodge in 1955. 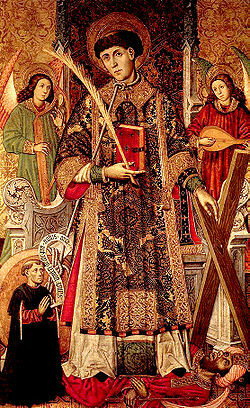 On the banner, St. Vincent is depicted with the fiery gridiron lying on the ground beside him. The crow stands near him whilst a wolf is shown in the background. Below is a scroll bearing the motto: "Patiendo Vincens." 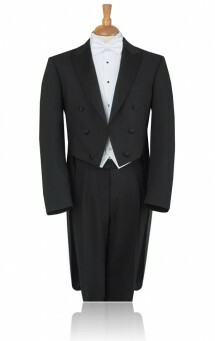 The original By-laws of The St. Vincent Lodge stipulated that the Officers should wear white tie and tails. To this day the Officers are encouraged to wear white tie and tails whenever possible and many other members continue to do so. The remainder wear "black tie." The Worshipful Master wears a cocked hat (worn fore-and-aft, with the rosette to the left) as he enters the Lodge in procession but removes it to open the Lodge. He only replaces it to retire, again in procession. 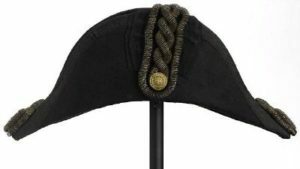 The original hat used by the WM, said to have belonged formerly to the eminent Bristol surgeon, resurrectionist and freemason, Richard Smith the Younger (1772-1843), was destroyed together with Freemasons' Hall as a result of enemy action on Sunday, 24th November 1940. The St. Vincent Lodge does not present each Master with a Past Master's Jewel after he has Installed his successor, as is the case in most lodges. 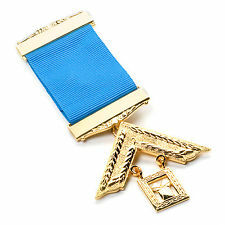 There are in existence a few Past Master's Jewels which are awarded to senior members of the Lodge for outstanding service. Each has a plate on the back of its ribbon outlining its history. See separate section on Past Masters' Jewels. At the end of his year in the Chair (1992) Frank Pearson's Circle were so sorry for him, because he hadn't been presented with a Past Master's Jewel, that they had a collection and bought one for him. On his death, this Jewel was passed to the Lodge by his widow and is now worn by the Immediate Past Master for the duration of his year in that Office. Lieutenant-Colonel James Roger Bramble F.S.A., (1841-1908), the founder of the Lodge, Worshipful Master in 1872-3, and 1879-80, and Provincial Grand Master for Bristol between 1906 and 1908 presented the Lodge with a silver Loving Cup to mark the 25th anniversary of the Lodge on 24th October 1897. The Lodge still possesses this Loving Cup which is used, once a year, to toast our Patron Saint at the meeting closest to St. Vincent's Night (22nd January). Dr Herbert Frederick (Bertie) Kay, (you have his dates of birth and death) senior lecturer in the department of Physics at the University of Bristol, and Sub Warden of Burwalls, served as Worshipful Master of The St. Vincent Lodge in 1978-79 and Chaplain from 1990 to 1997. He provided a compendium of the role and duties of the Master of the Lodge, known as "Bertie's Black Book" which is passed to each new Master upon his election.